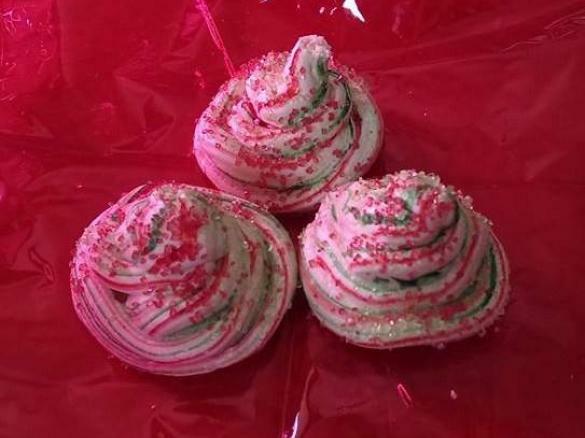 Xmas Peppermint Meringues by magnicar. A Thermomix <sup>®</sup> recipe in the category Baking - sweet on www.recipecommunity.com.au, the Thermomix <sup>®</sup> Community. 2. Line two baking trays with baking paper. Create 24 template shapes by tracing out shapes onto the baking paper. 12 per tray. Set aside. 3. Insert butterfly, place egg whites, cream of tartar and peppermint essence into bowl. 4 min/50C/sp3.5 until stiff peaks form. 4. Using food gel, paint 5mm stripes of alternating colours inside piping bag, all the way to the top. 5. With butterfly rotating 4-7 min/50C/sp3 add castor sugar 1 tbs at a time. Meringue should be smooth, not gritty when rubbed between fingers. Peaks should stay formed, if drooping, continue whipping. 6. Place meringue into piping bag, start swirling over your templates. Add sprinkles beofre placing in oven. 7. Bake 1-1½ hrs. Turn oven off and let Meringues sit overnight or for a minimum of 3 hrs to dry out with the oven door ajar. 8. Enjoy. Store in an air tight container for up to 1 week if they last that long. Whipping times will vary depending on the egg age size and temperature. Older eggs at room temperature will work quicker. Baking time will vary depending on the size of the meringue, the larger the meringue, the longer oven time. If you find the meringue are soft the next day, put them in the oven again for 20 minutes and let cool. Submitted by GFThermi on 2. January 2015 - 14:40. Thanks for the recipe! My son loved making these!